"To foster interest in the life and accomplishments of Henry Ford, and to preserve and interpret the landmarks associated with his life". The HFHA Book Award and the HFHA Literary Award are presented at the annual HFHA - Henry Ford Birthday Celebration Dinner which takes place in July. Henry Ford Heritage Association has the opportunity to present one book award to the newly published book we feel best embodies Henry Ford’s story. Candidate books can center on Henry Ford, his family, or his accomplishments. The award is presented at our annual dinner in July and the author is encouraged to be present and to offer the book for signing and sale. The author or publisher is permitted to use our logo and year of the award as part of their advertising and on the cover of the book. If you are interested in submitting a book to be considered for this award please download the HFHA – Book Award Application and follow the instructions. LITERARY AWARD: Crain’s Detroit Business , recipient of the 2004 HFHA Literary Award, for coverage of Ford Motor Company’s 100 years. Accepted by Keith Crain. BOOK AWARD: Mr. Ford R. Bryan, for his sixth book: Friends, Families & Forays: Scenes from the Life and Times of Henry Ford . LITERARY AWARD: Mr. Thomas McCarthy for his article entitled, Henry Ford, Industrial Ecologist or Industrial Conservationist? Waste Reduction and Recycling at the Rouge. Published in the Fall 2001 issue of the MICHIGAN HISTORICAL REVIEW. 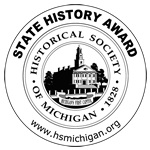 LITERARY AWARD: Mr. Phil Llewellin, Oswestry, England for his article entitled, After Henry: Touring Michigan In Search of reminders of Henry Ford, His Work and His Family. Special supplement to AUTOMOBILE MAGAZINE- ELEVEN JOURNEYS IN SEARCH OF THE FORD MOTOR COMPANY’S PAST.